Barmy Bella Children’s Entertainer and Magician based in Derbyshire. | Barmy Bella! 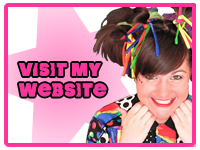 Barmy Bella is a full time professional children’s entertainer based in Derbyshire UK. She is a specialist in children’s birthday party planning and is constantly looking for new and exciting ways to entertain young children aged 3 to 8yrs.